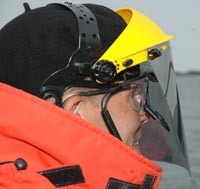 The ViewPoint EyeTracker® was recently used in a field study to study high speed navigation on board a 36 ft. large RIB (rigid inflatable boat) in the swedish archipelago in speeds up to 45-50 knots with no cabin or anything to protect you from the wind and sometimes exposed to water sprays. "The weather was sometimes raining and sometimes clear skies, and the eye tracker performed brilliantly!" A head mounted sun/wind block was constructed to act both as a sun block and a wind shield.
" One of our test subjects was using thick sun glasses with correction and they they were also adjusting their color depending on the light. He was completing the course in 47 knots with quite heavy maneuvers and we did not lose track of his eyes a single time during the entire trip." The study will continue in August with another 10 subjects. This project is studying information processing with regards to high speed navigation in shallow waters. We are comparing experienced high speed boat drivers, novice boat drivers and boat drivers from the rescue services (who are supposed to be able to handle a boat at high speeds but seldom has the formal education). The three groups all have in common that they have at least basic education in navigation and boat handling but not necessarily any experience in high speed boats, except for the experienced group. The reason for this is simply with respect to safety and especially since we use a course that is not free from other boats. In Sweden today, you can buy a boat that is capable of speeds far over 50 knots and drive that boat without any formal education or training. Every year there are a number of accidents as a result of high speeds, Poor knowledge and bad judgment. The Swedish maritime administration are currently suggesting that in order to drive a boat faster then 25 knots, you will need a drivers licence that makes you formally capable of handling a boat in high speeds. Our study looks at three "situations" along a route and how the drivers handle these situations in 25 knots and in 47 knots, in random order. The results consists of the scene camera video, showing how you seek/collect information using electronic sea charts, paper charts, radar, compass and how you observe the environment outside the boat. The drivers are also judged by an high speed instructor and the driver also completes a questionnaire regarding his/hers perceived performance and actions. Finally we also use log-files from the electronic sea chart to compare the two speeds, with regards to placement, planning and driver behavior. Responsible for the project and point of contact is Dr. Margareta Lutzhöft margareta.lutzhoft@chalmers.se) and Captain Fredrik Forsman (frdrik@forsman.com). 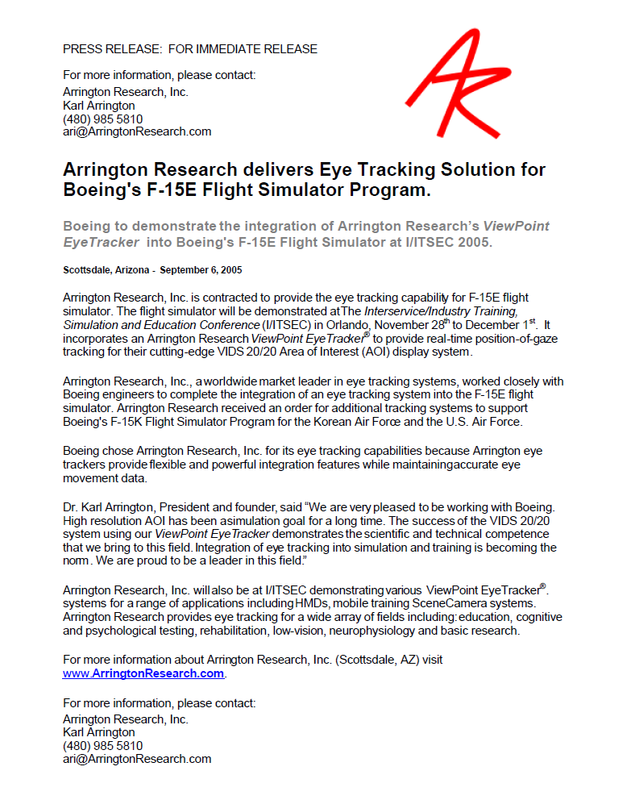 The ViewPoint EyeTracker ® has been interfaced with ART. This interfacing has been done by the Artificial Intelligence Group at Bielefeld University, Germany, in the course of the project "Modelling Partners" of the Collaborative Research Center 673 "Alignment in Communication". Target platforms are Avango and InstantReality. See video. Contact A.R.T. Click Image to play movie. Some of his most recent work using the ViewPoint EyeTracker ® compared avatar-mediated and video-mediated communication in truthful and deceptive scenarios. 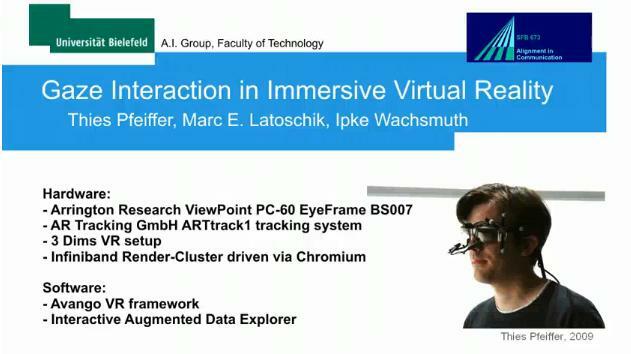 They tracked gaze, blinking and pupil dilation for analysis and also real-time replication in the avatars (i.e. the avatar's pupils dilate as the user's do, usually when telling lies). The second stage of the experiment involved asking people to judge the recorded interactions in terms of if they thought the avatar was telling the truth or lying. Avatars with the extra nonverbal information driven by eye tracking were more accurately judged than those without. TheViewPoint EyeTracker ® EyeFrame SceneCamera system were featured on NBC's Today Show. Click the image above to view the news segment. 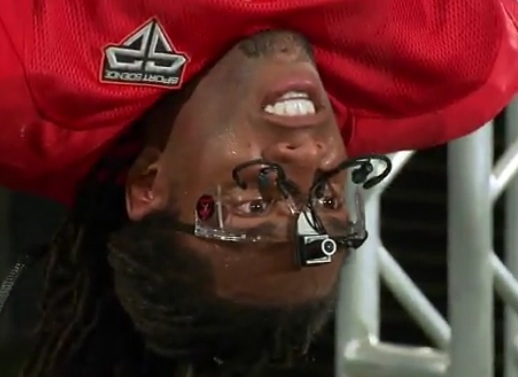 Larry Fitzgerald catches balls while hanging upside down and has 2x the average reaction time.